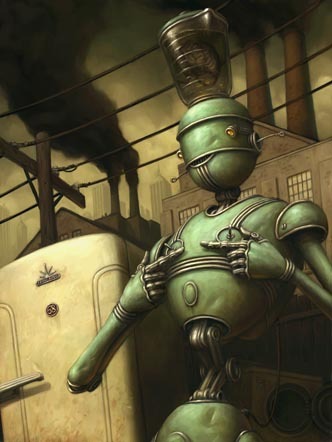 This ludicrous chap is yet another image for my seemingly endless "100 Robots" project. Though I'm pretty happy with the way this image turned out he hasn't gotten as great a public response as "Mr. Bubbles's Birthday". Perhaps the inherent emotions in the death of pet outweighs that of the tired, "brain in a blender" schtik. Perhaps it's that people are less willing to connect with the idea that our simple pleasures may be our undoing. Or maybe they just didn't like this piece as much as the previous one. What're ya going to do? I guess what they say is true, you just can't be "on" all the time. To that, I've only got this to say. Though I admit I have my moments as long as I'm louder then the guy next to me most of the time, I'll be happy. Also there's an old step by step still active on the old site which will show you, in exacting detail, the silly way in which I work.